Opportunity makes the most of its opportunity. Nov. 11, 1982 was a bittersweet day on Earth. It was Veterans Day; the Vietnam Veterans Memorial in Washington would be dedicated that weekend. And at NASA’s Jet Propulsion Laboratory in Pasadena, Calif., engineers made a mistake. They were trying to nurse along the Viking 1 lander on Mars, which had touched down there in 1976 — and surprised them by surviving in the eternal cold there for six years, three months, and 22 days. They transmitted new commands to the ship’s computer so that its batteries would hold a charge better. By accident, they erased data that helped the lander aim its antenna to Earth. Viking 1 was never heard from again. But its record for longevity has stood. Until now. 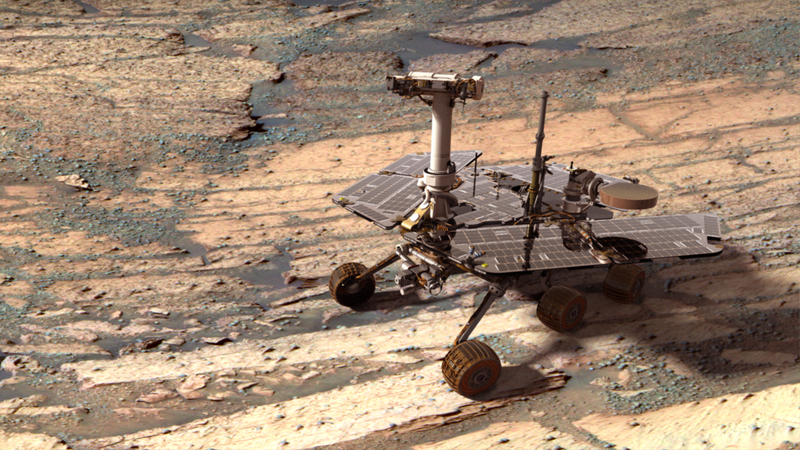 Today the Mars Exploration Rover Opportunity, which landed on Mars on Jan. 25, 2004, becomes the longest-lasting earthly visitor ever to the Martian surface. It is still going after 2,247 “sols,” or Martian days. It was designed to last for 90. Opportunity’s six wheels have occasionally gotten stuck, and one of them will no longer steer. Its circuit boards have had to withstand the subzero temperatures of Martian winters, and another is beginning. Its solar panels, at times, have been covered with fine red silt, which made them almost useless for gathering sunlight to make electricity. Life on Mars is tough. But the solar panels have mercifully been blown clean every time by gusts of wind, much to the relief of NASA engineers. Careful maneuvering has gotten Opportunity out of the sand — once after six weeks of trying. Today they celebrated Opportunity’s record by doing what they’ve been doing since 2008 — keeping the rover on a forced march to a large crater called Endeavour, now eight miles away on the horizon. It’s Fallen, But Can It Get Up? After months of tests and analysis, engineers plan to beam commands to NASA’s Spirit Mars rover Monday, kicking off a long-awaited attempt to free the hardy craft from the talcum powder-like soil of a hidden crater that trapped it last April. “Spirit’s facing the most challenging situation it’s seen yet on the surface of Mars,” Doug McCuistion, director of NASA’s Mars exploration program, said Thursday. “We know a lot of people around the world…view Spirit with great affection, exploring the Red Planet along with it, experiencing the excitement, seeing new and exciting vistas, seeing new landscapes, uncovering some incredible new knowledge about our sister planet. Last April 23, the six-wheel Spirit was slowly rolling backward on the western side of a feature known as “Home Plate,” heading toward the south and a pair of volcanic structures that scientists wanted to examine. The rover was driving backward because its right front wheel stopped working in 2006. The ground to the south of Spirit looked normal, but as it rolled along, its wheels broke through an upper-crust-like layer of soil and into a softer, unseen material. Scientists later determined that Spirit’s path was straddling the rim of an ancient, 26-foot-wide crater just beneath the surface. The crater was filled in with sulfate sands that formed layers with different compositions. Initial attempts to drive out in a crablike fashion by turning the front and back wheels in the same direction only made matters worse. Well, this seems to be quite the heroic rescue attempt for a rover that’s already five years past its three month life expectancy. Go NASA!